After two weeks in San Diego, it was time to explore some more of California and so I got on an overnight bus to San Francisco. I arrived there at 7 o’clock in the morning and was pretty happy when I made it to the hostel and learned they were just about to serve free breakfast! It was one of the best free breakfasts that I have experienced in a hostel so far – not only because I was tired and hungry, but simply because it was really good! They had bagels, cream cheese, jam, peanut butter, freshly cut fruits, cereals, eggs, orange juice, tea, coffee… pretty much everything you need for a good start into your day (except for Nutella)! The dining room itself was also really cool – it seemed to have been a huge festive ballroom and it still had a little concert stage, leather booths and huge tainted glass windows through which one could see the San Franciscan high rises… So if you ever happen to be in need for a hostel in San Francisco, I obviously would recommend this one, “The Green Tortoise”. The rooms and bathrooms were nice and clean as well, the staff friendly, they had a lot of communal activities organized and it is perfectly located between China Town and Little Italy. So on my first day in SF I started roaming around the area and discovered China Town, which is actually like BEING in China, as an Australian-Chinese friend, that I met in the hostel, confirmed. I also wandered through the main Business District with all its stores and over to the Ferry Building Marketplace, an organic food market, and then met up with my former flatmate from Berlin. She studies in San Francisco now and took me to a local beach in Sea Cliff from where I had an amazing first view of the Golden Gate Bridge. We then took a nice stroll though the Presidio, the parkland surrounding the Golden Gate Bridge and had burritos for dinner together at her place. Tired after a night on the bus and walking through the city, I headed back to the hostel and fell asleep pretty much straight away. The next morning I started my day with another stroll through China Town and then got on one of San Fran’s infamous Cable Cars, going up and down the steep hills of the City! When I got off, I got on a bus and let it take me to the northern shore – I ended up at the Aquatic Park Pier from where I had another view onto the Golden Gate Bridge, now having seen it from East and West. 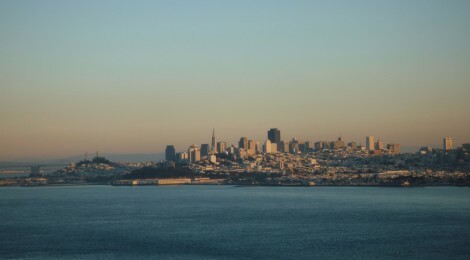 I strolled along the shore and along the Fisherman’s Wharf and Pier 39, quite touristy areas with lots of shops and restaurants, through the neighborhood of North Beach all the way up the steep streets of Telegraph Hill to the Coit Tower from where one has an amazing view over the city! In the afternoon I met up with a friend I had met on the Big Island and we re-lived our awesome Volcano experience together once more. I returned at the hostel just in time for a common dinner in an Italian restaurant around the corner, where I met some really nice people I would hang out with the next day. We went on a walk through the Golden Gate Park, which is really nice but turned out to be by far bigger than we had expected! We walked it all the way from its Eastern corner to the Western boarder, the San Franciscan Ocean Beach, and were relieved when we found a grocery store and a bus stop there! None of us had expected such a long hike, and even though it was really cool to see the bisons and some amazing trees, we were a little bit disappointed by the fact that one would have to pay entrance fees for all the really interesting parts such as the Chinese Garden, the Botanical Garden or the museums… As we were all not willing to pay, we simply enjoyed the walk through nature and after our much-needed lunch break got a bus to bring us to the southern tip of the Golden Gate Bridge to finally walk across it. The next morning it was time to say goodbye to San Francisco and all the great people I had met there to finally start the last week of my Californian adventure: my road trip down the Pacific Highway!